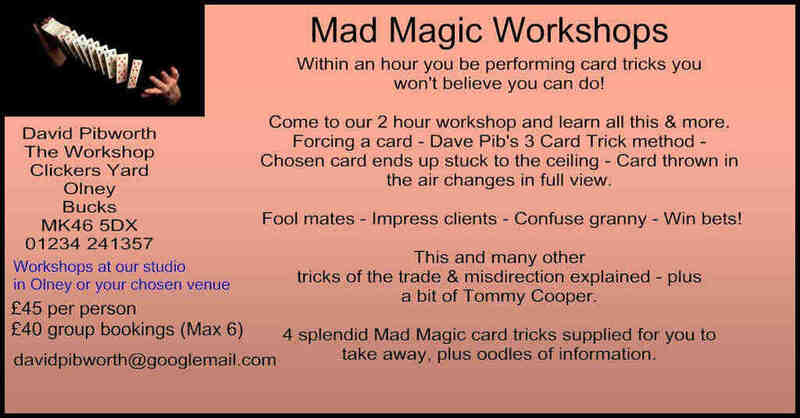 My magic workshops are great for teaching you the basics of a magic show. What you learn from me are the basics. This includes making a silk square disappear and re-appear from wherever you like. Also, the easy way to get someone to take the card you want them to and, believe it or not, this can be taught in minutes. is also part of it." That's when you show a colouring book to have black and white pictures, then colour pictures and then the pages go blank! No switching books, oh no. It's much easier than that and so easy to learn. You receive the colouring book and indeed all of the above in the price of the workshop and you will learn lots more. Even with the items above you will have a magic routine that will wow many people. It just takes a bit of rehearsal to do it in your own style. I advise on all the little bits of misdirection that just make everything so much better. "There are also great discounts to be had for any of the magic I sell." For more details of magic equipment and the magic workshops please visit my website at magicandmore.co.uk or give me a call on 01234 241357 and let's see how I can help you.